Whether you want to remove blemishes from your complexion or reduce wrinkles and fine lines, Image MD has the products you need for a flawless face. Your spa attendant can apply these products during your facial services, and if you’re a beauty professional, you can distribute the products to provide your clients with a youthful and beautiful glow. Items like the Reconstructive Facial Cleanser contain alpha and beta-hydroxy acid, which prompts quick cell turnover and removes dirt and impurities from the cells. These acids also help to lighten dark spots on the skin and gives the complexion a bright and rejuvenated look. The product is also ideal for removing makeup from the skin, making it suitable for use at night or before a facial. 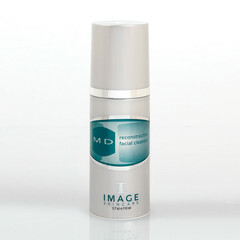 The Image MD Reconstructive Facial Cleanser is suitable for all skin types. If you’ve spent a lot of time in the sun or have clients who often complain about age spots, purchasing the Reconstructive Lightening Creme is a great choice. The product is free of harmful ingredients like parabens and protects the skin from free radicals due to its vitamin E and C content. You can offer this product to your clients for nighttime application, or apply to a patient’s face after a laser treatment. The Lightening Creme works especially well when a client uses sunblock daily. Medical spa doctors and dermatologists have plenty of positive things to say about Image MD, which may help to convince you to include the products in your customer offerings. For instance, Dr. Paul Greenberg of Ageless Remedies confirms that the products are especially effective, and that patients have had favorable results. Surgical assistant Theresa Wildman also agrees that Image MD products are effective and affordable, and that her patients have noticed a significant improvement in their skin after becoming Image HD customers. If you’d like to locate an Image HD distributor in your city or want to sell the products in your spa or doctor’s office, call 1-800-796-SKIN for more information.